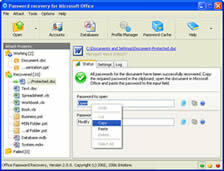 Office Password Recovery is an "all-in-one" solution for recovering all types of lost or forgotten passwords for Microsoft Word documents, Microsoft Excel spreadsheets, Microsoft Access databases, Microsoft PowerPoint presentations, Microsoft OneNote notebooks and Microsoft Outlook e-mail accounts and personal folders files. 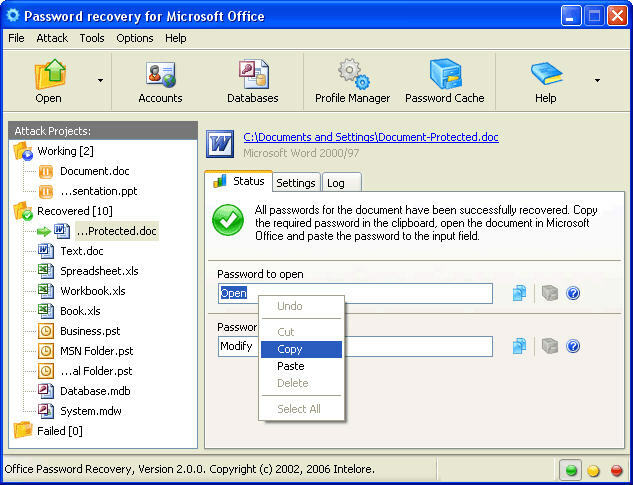 Office Password Recovery recovers all types of passwords, including instant recovery of passwords to modify, database passwords, workbook passwords, sheet protection passwords, pst passwords, email accounts passwords, user-level passwords, and much more. The program supports all versions of Microsoft Office, including 2003. Microsoft Word passwords to modify and document protection passwords (*.doc, *.dot), Microsoft Access passwords to open and user-level workgroup passwords (*.mdb, *.mde, *.mdw, *.mda) are instantly recovered. Instant recovery of MS Excel workbook, worksheet, sheet and spreadsheet passwords regardless of their length and complexity (*.xls, *.xla, *.xlw, *.xlt, *.xlm). Instant recovery of Microsoft Outlook and Microsoft Exchange passwords to open personal folders and personal storage files (*.pst, *.ost), including compressible, best and high encryption. Instant recovery of MS Outlook e-mail accounts and pst passwords, including GMail, Hotmail, Yahoo and MSN accounts. Office Password Recovery instantly recovers shared protection passwords, formatting and editing restrictions, locked cells protection and permissions. The human factor is taken into account - even a password containing typing errors will be recovered! Instant recovery of MS PowerPoint passwords to modify presentations (*.ppt, *.pps, *.ppa, *.pot). Office Password Recovery instantly recovers password to open Microsoft Word documents and Microsoft Excel spreadsheets if they were protected using weak encryption. This includes Microsoft Excel 95 / Microsoft Word 95 (and older) documents and workbooks, MS Excel 97-2000 / MS Word 97-2000 (on a computers with French regional settings) and Microsoft Excel 2003/2002 (XP) spreadsheets and Microsoft Word 2003/2002 (XP) documents if the Weak Encryption (XOR) was used. Ability to manually change the processing priority of the program. By default, the recovery process is done in background, allowing the user to continue working with other programs. Comprehensive approach to recovering Microsoft Excel, Microsoft Word, Microsoft OneNote, Microsoft PowerPoint file-opening passwords, which allows simple attacks such as BruteForce, SmartSearch and dictionary-based, as well as complex approaches combining several types of attacks. Support for simultaneous processing of several password recovery projects. Several attacks (using different attack profiles) can be conducted on one file simultaneously. Technical support is provided by highly qualified specialists.